Previouly we wrote about what would be happening over the weekend at the first ever O Comic Con! at the Mid-America Center in Council Bluffs. Walter Koenig of Star Trek: The Original Series was there. Jamie Bamber of Battlestar: Galactica was there. Professional wrestler Mick Foley was there. Voice actors Billy West of Futurama and Maurice LaMarche of Pinky and the Brain were there. Naomi Grossman of American Horror Story and Tara Buck of True Blood were there. There also hundreds of attendees, three days worth of panels and nearly 100 vendors from Omaha, Council Bluffs, Kansas City and beyond. They came, they saw, they partied. So here are some of the small highlights from this big event that I thought were worth mentioning. Kelly of Kandell Cosplay and Beth of Dooley Noted Cosplay came together Friday for a Nerds and Feminism panel in front of a packed room. They discussed some of the most common (and most problematic) stereotypes for both male and female characters in comics, video games, and nerd culture in general, as well as how to improve characters to be more than just a gender stereotype. They also talked about the myth of the “fake geek/gamer girl” and the double standards women in the subculture face. This included discussing how to not bully a person and be accepting of the fact that not everyone can have read every comic and novel ever, seen every episode and movie ever, and own every piece of memorabilia. Finally and perhaps most importantly, they discussed the issue of respecting women in nerd settings, especially when it comes to women in costume at a convention. They discussed how to stand up for others in the community, especially focusing on men holding their friends accountable when harassment or rude jokes are happening. Cynthia Martin, a name in comics since the 1980s and one of the few women wading through the boy’s club, spoke in a big room to a tiny but enthusiastic audience. This “Q and A” was actually more of Martin telling stories from her time working on Star Wars, the desperate struggle of Marvel to stay relevant, and the scene as it stands today. She spoke of being “the worst thing to happen to Star Wars in twenty years (according to some guy she stood behind at a convention) and the shifting landscape that is a comic industry that outsources for its artwork and and no longer seems to work together like it did long ago. (She also started to talk about Marvel writers’ “daddy issues” but cut herself off, saying she could talk about that all day.) Martin is currently living in Omaha and pursuing a nursing degree while writing graphic novel biographies for Capstone Press. Keeping Martin company on her panel was Jerry of Worst Comic Podcast Ever, who took time to talk about the charity The Hero Initiative, which helps freelance writers and comic artists deal with things like getting health insurance and keeping the lights on. The Hero Initiative runs on donations but also frequently auctions off comic sketches, memorabilia, prints, and other neat stuff to raise money. Set up in the hallway was a booth for Amtgard,a motley crew of men and women dressed in various medieval garb and holding foam weapons. They held a very enthusiastic demo outside the convention center on Saturday afternoon. For those who don’t know, Amtgard is a boffer weapon fighting live action roleplay (larp). This means people construct weapons that look neat and sometimes even realistic but are actually made of very soft foam and then proceed to hit each other with them. It’s actually a lot cooler than that description may allude and can also involve intricate costuming and roleplaying out a fantasty character of your own design. For those who are interested, they have a facebook group and website with tutorials. They meet every Saturday at Elmwood park from noon until they are too tired (or for the summer, too hot) to play anymore. Their next event is June 6 and according to their calendar is labeled “Good Day” (as opposed to Evil or Goblin Day). On the expo floor, there were booths representing essentially anything you could expect: comic book stores, comic book artists, fantasy writers, live action role players, jewelry makers, weapon makers, armor makers…the list goes on for several pages or scrolls of your mouse. Talking to the exhibitors revealed that Omaha is not barren of comic book and fantasy writers. Matt Hebert is an Omaha resident who recently self-published his first book through Amazon and is hard at work on his second. The book is called “Beneath the Surface” and follows Sembado, a young man living a blissful life in an establishment on the ocean floor. He has never seen the surface, never even been close to it, but is fascinated by it. Something (no spoilers) happens and Sembado finds himself thrust into a web of secrets and lies along with his grandfather. Their adventure will lead them to reexamine everything about their subaquatic home and the authoritarians who work so hard to keep them from leaving it. Hebert brought 50 copies of the book to O Comic Con and by the end of the weekend had signed and sold every one of them. Every person who bought one also entered their name into a drawing to be the inspiration for a character in his sequel, which is currently in the works. Look for a review of the book here once I finish it and in the meantime, get the book yourself through Amazon. Another booth in the con featured an unlikely trio coming together to convert an already successful novel into a graphic novel. Gary Gabelhouse of Lincoln has published five books, one of which has been turned into an audiobook and will soon be a published graphic novel as well. “Prophets Reborn” finds protagonist Gabe Turpin in a frantic fight to save the world (or at least three major faiths of the world) from destruction at the hands of sinister forces using ancient secrets and advanced technology. Gabelhouse admits knowing nothing very little about comic books or conventions, but at the suggestion of his publisher has worked to give the book visual form. Gabelhouse is joined by Andrea Davis on illustration and Wes Staley on cover art and captions and lettering. Those who came to the booth were given the opportunity to sign up to receive a copy of the novel—a martial artists action mystery from the sounds of it—once it was fully revised. Information on the graphic novel can be found on Gabelhouse’s website. 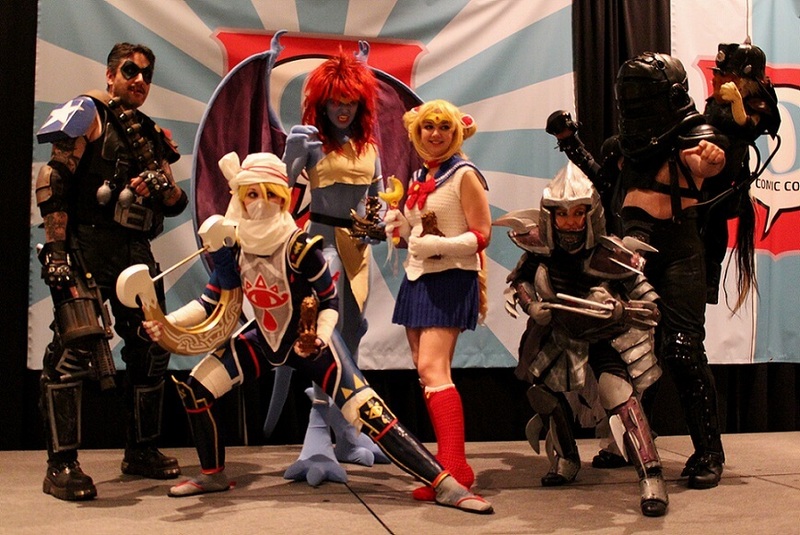 Last but certainly not least, there was the cosplay contest. Cosplay, or costume play, is an artform. Cosplayers devote money and hundreds of hours sewing, painting, shaping and creating replicas of costumes from pop culture, television, movies, books, comics…you name it, someone has cosplayed as it. O Comic Con! had a staggering 82 contestants in their cosplay contest, for which there were awards for Best in Show, Craftsmanship, and Creativity. The judges (three celebrated cosplayers in their own right) also awarded three honorable mentions. Pictured in the top photo are the winners. There were many more stories from O Comic Con, stories of panels and sword fights and autographs. There were things bought, business cards exchanged, comics read, and fangirling fangirled. What was your O Comic Con! story?